In an ironic twist, Sega have copied Sony, by secretly putting Dreamcast consoles inside washing machines. The missus went out, so I thought I’d impress her by showing her how much of a modern man I am, by attempting the washing. It’s the proper logo colour too. Not that stupid blue one. 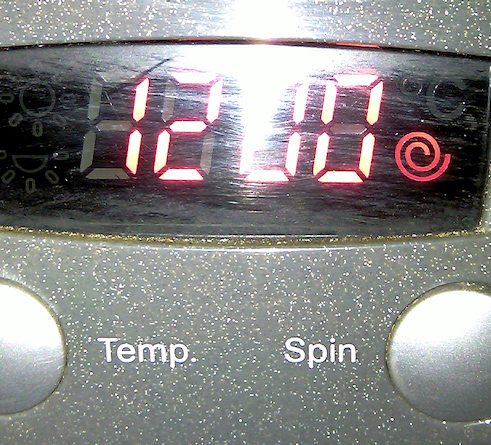 The washing machine even appears to be washing things, and it hasn’t caught fire. Brownie points all round. This’ll make up for the last eleven-ish years of erratic mood swings. After three days of not-updating, here’s something that looks like the Dreamcast logo. Very, very sorry about this. Put it down to seasonal affective disorder. “Dreamcast’s coming back. Japanese logo, European logo and some new logos, too” – F.
Sorry, both in advance and in retrospect. “All was well as I popped up this cheery 21st birthday banner for my step-son. However, imagine my surprise upon suddenly discovering the hidden message” – Neil. 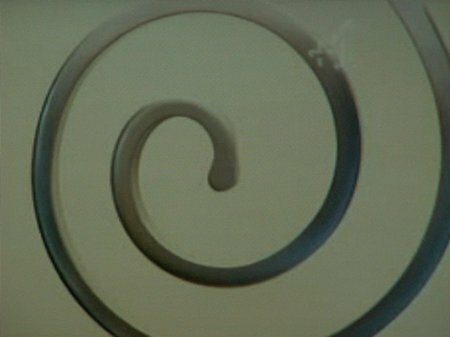 What does the spiral symbolise here? Stars are bright and cheery, and can be easily associated with a party. But what’s a spiral? 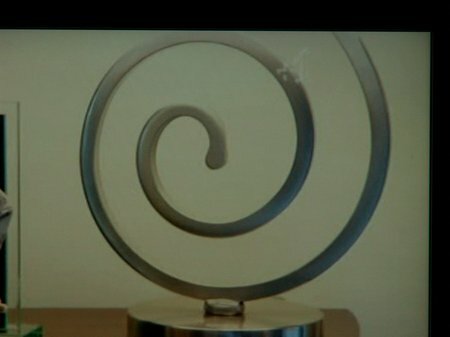 What’s happy about a spiral? We’ve been putting them in a folder instead of on the internet, due to public demand. So here they all are at once. This is about six months worth. If you sent any of these in – thanks. We don’t mean to sound ungrateful it’s just that some people don’t understand and the world just isn’t ready yet etc etc. Viral marketing. Dreamcast 2. Blah blah blah. Good god, we’re even bored of listening to our own predictable internal monologue. How much longer must we endure this… this… this LIFE? Found here and sent in by a “Bitmupp”. Obviously not what you were hoping for. It’s not even that photo of the girl without any clothes on with only a Dreamcast covering her bits that we get emailed about once a week. 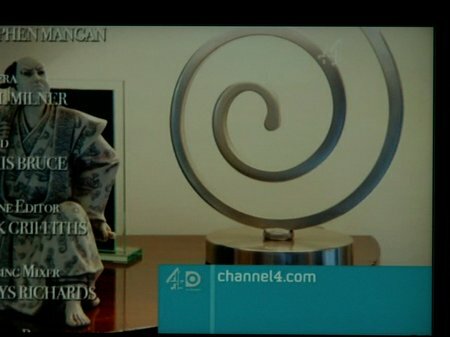 “Just realised, I hadn’t checked 4OD – Could’ve saved myself a lot of trouble by just pointing you here. 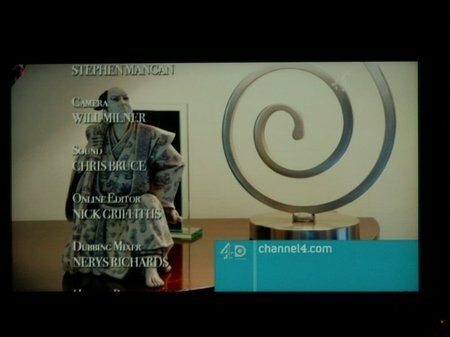 Dunno if it’s anywhere earlier in the show, but it’s in the end titles for two seconds at 47:27″ – GigerPunk. The EXIF examination reveals the shots were taken using an extremely boutique Konica Minolta DiMAGE Z5 camera. Does anyone want to attempt identifying the make & model of TV by estimating pixel counts and cross-referencing the data with placement of the power LED? Great news! SEGA may now be able to claim 0.01% of the revenues from all past Mario games, which will be the financial equivalent of the money generated by 1,000,000 Madworlds. “I was bored the other day so I thought I’d dust down my old games collection and pop in a game called Super Mario Sunshine, a game by Nintendo based on an Italian plumber called Mario who likes spaghetti and meatballs. As I was playing, and to my amazement I noticed the Dreamcast logo in the game!” – Mark. Sorry about the quality of posts recently. It might be something dietary, or the weather. Hopefully motivation will return in Q3. Only this for today. Have spent way too much time angrily Googling “Train2Game” YET AGAIN all of yesterday and today and have nothing else to give. “Actually, The Guardian has it all wrong, it’s not people searching Google for art, but people looking for Dreamcast logos to submit to UKR” – Adam.